Iyama Makes Good Start In Honinbo Title Defense: The difference in experience seemed to be a big factor in the opening game of the 69th Honinbo title match, which was held on May 14 and 15. Though still only 24 (until May 24), Iyama Yuta Honinbo (right) has already played in eleven best-of-sevens (and won seven of them). 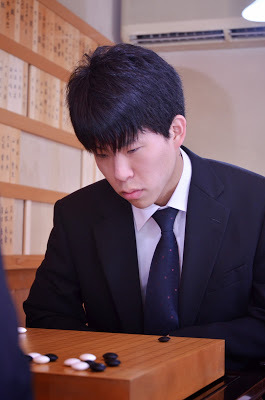 In contrast, Ida Atsushi 8P, at 20, was playing in his first title match and was the youngest player ever to challenge for the Honinbo title. One advantage for Ida (left) is that this is the first time that Iyama has faced an opponent younger than himself in a title match, so he will now know how his seniors felt. The opening game was played in Ida’s home town of Suzuka in Mie Prefecture, so he also had the overwhelming support of the fans on the spot. The game was actually played in the Tsubaki Okami Yashiro, a Shinto shrine, in a building called the Sanshuden, which had just been renovated as a training center. This game was held to celebrate the upcoming official opening of the hall on May 18. The arrangements for an event like this are made many months in advance; Ida was a complete dark horse in the Honinbo league, so city officials had no way of knowing that a local player would be starring. Ida drew white in the nigiri. The game started with his taking profit in three corners, letting Iyama build a moyo. Ida made an invasion on the right side and had to fight hard to settle his group. However, he then had to switch to another invasion at the top before he had made the side group completely alive. Iyama made a clever placement on the side that set up a double attack on the two groups and he was able to kill the one at the top. Ida was forced to resign after 197 moves. Kisei B League Starts: The first two games were played in the 39th Kisei B League on May 15. Murakawa Daisuke 7P (W) scored an upset half-point win over Yoda Norimoto 9P and Kobayashi Satoru 9P (B) beat Cho Riyu 8P by resignation. The A League starts on the 22nd.